Our most popular gift box. This is a great all-purpose gift, built from foods the recipient can snack on right out of the box. Whatever the occasion, folks will dig right in. The Weekender. Illustrated. Hand assembled in our cartooned gift box with a loaf of Zingerman’s Artisan Bread, a Walnut-studded Magic Brownie and a Sea Salt Topped Pecan Blondie, Zingerman's Peanut Brittle, La Quercia's Borsellino Salami, Virginia Diner Peanuts, and a nosher-sized version of our extremely popular, extremely good Sour Cream Coffee Cake. 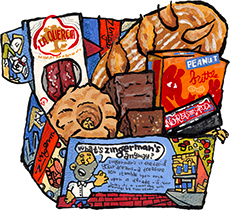 The Long Weekender, packed in a handsome wooden crate, includes all the items in the Weekender plus Zingerman’s freshly roasted Coffee, Zingerman's Banana Bread, a Ginger Jump-Up Molasses Cookie, Koeze Cream-Nut Peanut Butter, and Vanilla and Chocolate Coconut Macaroons. The Baked Weekender is packed in a giant wooden crate. It includes all the items in the Weekender plus a loaf of Chocolate Sourdough Bread, a no-nut Black Magic Brownie, a box of four assorted mini sweet scones, a bag of buttery Palmiers, a raspberry-filled Patti Pocket hand pie, a nosher sized Perky Pecan Pie, an almond and orange scented brioche Bostock, two Oatmeal Raisin Cookies, and two Sky’s the Lemon Cookies. "We particularly enjoyed the tangy sour cream coffee cake. Overall, this is a solid collection for snacking and would be appreciated at a gathering."